Where In The World Is Lance? : CHA Giveaway! One lucky winner will receive..
PLUS a BRASS KNUCKLES t-shirt (size L)! To enter, just leave a comment within this post and we will choose one winner at random sometime tomorrow! Please note that the shirt is ONLY AVAILABLE IN A SIZE large due to the fact that they are printed in VERY limited quantity and usually only go out to Rusty Pickle employees who work at CHA shows! Thank you and good luck! THE FINE PRINT: Winners will need to email rustypickleblog@gmail.com in order to confirm their prize as well as submit their mailing address. In the past, we have asked entrants to wait until shipments arrive to our warehouse before they were sent out to winners. However, due to your feedback, we have decided to only offer giveaways this week that are already at the warehouse- which means that these items will be available to ship as soon as we return back from CHA. Therefore, winners should allow for approximately 4 weeks for their prizes to arrive. We thank you for your patience. If you have any questions, please do not hesitate to contact us via the blog's email address. awesome colors and great stuff, plenty to get some pages done!! Is it too late? Pick me! Way to go Lance!! Great prizes!!! Hope I'm not too late to enter! Puh-leeeez tell me I'm not too late!!! I would LOVE-LOVE to win these. I'm in desperate need of some scrappin' goodness to perk up my summer :) This would be PERFECT! 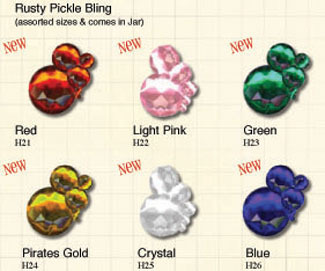 what a cool prize and of course wonderful terrific fun Rusty Pickle new lines!!!! and that bling is soooo cute!!! Thanks for offering such a great giveaway!! Love your products and your classes! Thanks for sharing. The new stuff looks amazing! What a fun, inspiring blog. Sounds like CHA was a blast for you. hola! this is it! 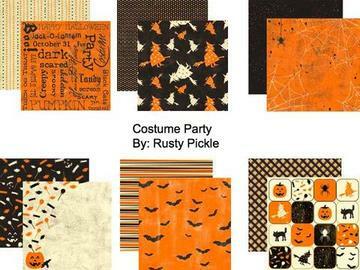 .... i love rusty pickle new products!!! pick me please! so excited to have it with me now! I will include this to my prayers. More power! This is my chance of giving my wife the best gift that she ever has! I am pretty sure that she would love this gift. Give me the chance. Cheers! Please throw my name into the hat! I absolutely love those papers! Oh, how FUN would that be! Thanks for the great products!!! i really really hope i win (hehe) rusty pickle's new ranges look totally fabby!!! Love the fabulous new lines. Love to win them even more. Oh my gosh the bling jars are to die for. I hope I win! Oh Man!!! I'd love to win!!!! What wonderful goodies!! I don't expect to win knowing my record but just wanted to leave a comment on your great products. Holy Cow Fabulous candy! Thanks for a chance to win these yummy goodies! Yes sir baby- I would so love that RP package. I love Rusty Pickle products! Thanks for the chance to WIN. :) I met Lance in Goodyear Arizona in 2006. Wow what a fabulous prize. To make it to a CHA is my dream! 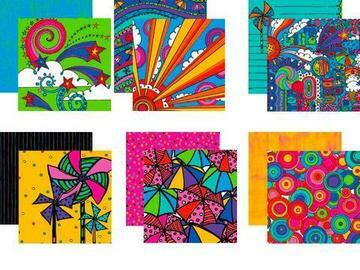 Maybe next year and those Candyland papers are just perfect to scrap my busy little ladies, I'd love a chance to win. Taking Rusty Pickle to Japan!